The Dakar 2012 has ended. In total the rally proclaimed 156 withdrawals in the car category. Therefore fhe Sisterna Dakar team is glad to have finished as 67. Since 2002 Fast & Speed is competing in Rally Raids and the Dakar Rally, with a specially designed two wheel drive buggy. Because of the racing sport history Fast & Speed soon made a name of itself in these competitions. In the first couple of years Thierry Magnaldi drove the two wheel drive buggy and finished a couple of times in the top ten overall during the Dakar rally. The first major result was obtained in 2005, when with our buggy the 2 wheel drive category was won in the world cup for cross country rally. In 2006 Fast & Speed won the two wheel drive category of the Dakar. After these wins Fast & Speed competed almost every year in the Dakar rally with success. As a consequence Fast & Speed was the first Dutch car manufacturer to win in Dakar and the first one ever to participate in the World Cross Country Rally Championship. In 2009 the Dakar rally has moved from Africa to South America because of safety. Here in South America Fast & Speed won in 2009 and in 2010 the two wheel drive category. The latest EVO IV buggy which has been used for the Dakar rally in South America has a v8 4,4 liter engine with 310hp and Reiger suspension. This buggy is also equipped with an internal front and rear tire pressure system, a hydraulic lifting system and a stabilizer system on the front and on the rear axle. 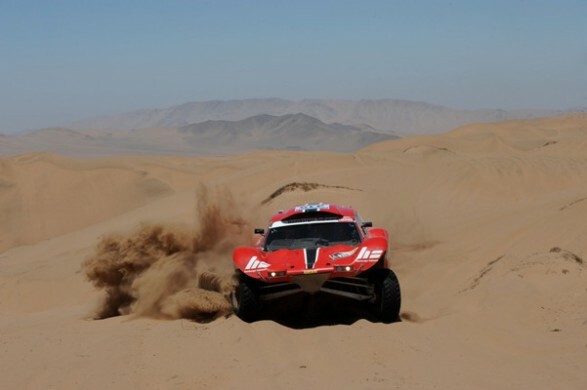 Because of the successes Fast & Speed has become an complete rally raid specialist with all infrastructure to build and rent competitive racing cars and is capable of providing in-race assistance during off-road events. Copyright © 2014 Fast & Speed. All Rights Reserved. Designed by ZichtbaarZijn.